The ARBURG Technology Days 2017 will be held at the ARBURG headquarters in Lossburg (Germany) from 15 to 18 March. Around 50 exhibits will demonstrate the current state-of-the-art of plastics processing technology. 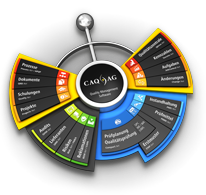 Efficiency Arena on the topic of "Industry 4.0"
CAQ AG will be present at the Technology Days and showcase its quality management solutions for the plastics industry as well as its CAQ.Net® -> ARBURG ALS interface. The interface directly exchanges all process parameters from ARBURG electrical, hybrid, and hydraulic injection moulding machines with the CAQ system. This direct connection with the ARBURG ALS manufacturing execution system facilitates a consistent and uninterrupted quality management workflow.